Little did we know last year that our annual holiday cover — a reproduction of a painting by Lawren Harris — would be quite so appropriate for 2016. Harris enjoyed a renaissance this year as the subject of both an Art Gallery of Ontario exhibition curated by Steve Martin and a documentary by White Pine Pictures. Upon review, our cover photos were a good barometer of the stories featured in our pages throughout the year. Our April cover, for example, showed a canoeist portaging across Bay Street on Davenport Road, part of the old Aboriginal trail linking the Humber and Don rivers. It not only reminds us of the rich heritage of our Aboriginal and Indigenous community members, but of the importance of the work of the Truth and Reconciliation Commission. In August, the cover photo of a rail derailment summed up a year’s worth of coverage quite succinctly, while the actors, artists, and athletes gracing our first page reflect the diversity of our coverage area. All of that said, some themes did emerge time and time again, summarized in what is becoming a December tradition: our year in review. While development continued to dominate our pages in 2016, we are starting to see a new layer added to some projects: sustainability. Set to open next year is One Spadina Crescent, which features storm water harvesting, green roofs, and large windows that invite light into the building. There are also spaces for bicycles, which in turn take centre stage in Westbank Project Corp.’s plans to redevelop the parcel of land including Honest Ed’s and Mirvish Village. The proposed new development entrenches cycling as a primary mode of transit, providing for a bike valet and repairs. The company has said it is aiming to meet LEED Platinum Neighbourhood and Toronto Green Standard Tier 2 for Mirvish Village, and has planned to include a centralized heating and cooling plant that will transfer energy between individual buildings, as well as green roofs. It’s exactly the type of sustainable development many in the community would like to see — albeit on a much smaller scale — enshrined at the new Catholic school set to be built on Barton Avenue where St. Raymond Catholic School currently sits. Abutting Christie Pits opens up a wealth of opportunities — school gardens and the like — and many parents view this as a chance to incorporate green education into the school’s curriculum. When will Toronto gain control of its destiny? When read in concert, a series of seemingly unconnected articles on the Ontario Municipal Board (OMB) and crumbling infrastructure in public schools hints at the biggest challenge facing Toronto: our ability to control our own destiny. Take the Toronto District School Board (TDSB) budget as an example. The province does a very good job of convincing the TDSB’s stakeholders that the board is unable to manage its own money. However, the TDSB has no say in how much money it pays its staff, one of the biggest line items in the budget, and no ability to raise additional funds to pay for things like much needed infrastructure repairs. And the TDSB is but one example of the many publicly-funded institutions in the city that rely on the province for money but don’t get nearly enough in sustainable funding. With the city scrambling to fill the cracks — both literally and figuratively — left behind by the province, it’s no wonder that there isn’t a lot of money left behind to fund things like transit. At one point in its history, this newspaper ran a lot of articles floating the idea of reclassifying Toronto as a province. Perhaps it’s time to resurrect that discussion. The biggest surprise to come out of the province’s review of the Ontario Municipal Board (OMB) is that not everyone would see it abolished. Some argue that it should be reformed, while others would like to exempt Toronto from its oversight completely. Watch this space for an article in January, but suffice to say that everyone agrees it cannot stay as it is. And no wonder: nearly every article about a development published in these pages references the OMB, usually relating a resident’s concern that the provincial agency (okay “arm’s-length” agency) will overturn a decision made by Toronto City Council. That’s not to say that the city gets off without criticism, for there are often rumours of secret, last minute deals swirling around big name developments. What’s particularly clear is that we need a transparent, consistent, and effective process for evaluating development applications in this city. PHOTO BY BRIAN BURCHELL/GLEANER NEWS: Michael Etherington, manager of cultural programming at the Native Canadian Centre of Toronto, who argued that incorporating Indigenous teaching techniques in so-called traditional educational institutions could prompt a complete paradigm shift. The Truth and Reconciliation Commission of Canada (TRC) published its final report almost 18 months ago, including 94 Calls to Action aimed at redressing the historical imbalance caused by our nation’s Indian Residential Schools. A significant number are education-related reforms, and educational institutions in our coverage area are starting to pay attention. 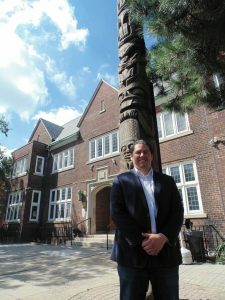 The University of Toronto steering committee mandated with prioritizing the institution’s response to the TRC is slated to submit its report by the end of this year, and has established five areas of focus: Indigenous curriculum, Indigenous students, Indigenous faculty and staff, Indigenous co-curricular educations, and Indigenous research ethics and community relationships. The Toronto District School Board has also begun to respond, and as of September, students at all of its schools make an Indigenous land acknowledgement before the singing of the national anthem. These are small but important steps on the path to reconciliation. PHOTO BY R.?S. 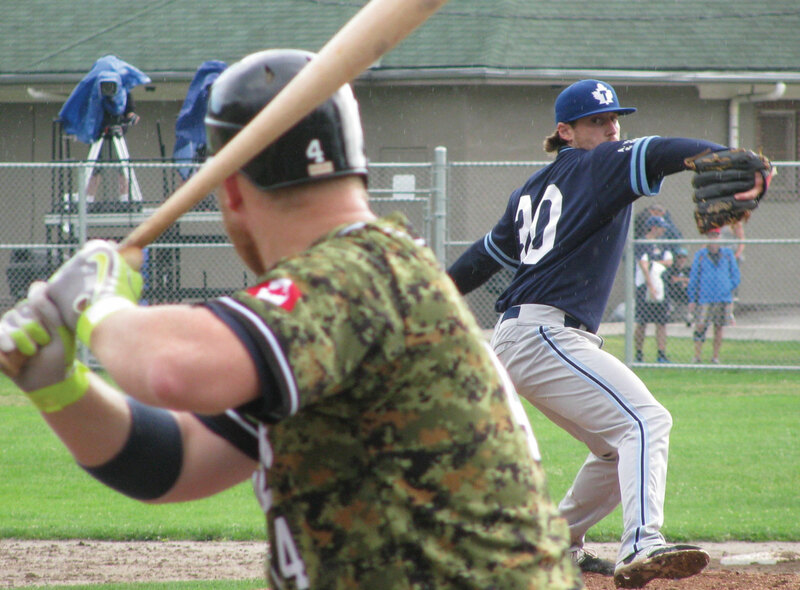 KONJEK/GLEANER NEWS: Brett van Pelt of the Toronto Maple Leafs delivers a pitch during the final game of the recent season on July 31. No, we don’t mean the Blue Jays, or the Toronto Maple Leafs hockey team. We mean the other Maple Leafs, the ones that actually win a game or two: the Toronto Maple Leafs baseball club, who play at the diamond at Christie Pits. Like the Toronto Football Club, our Maple Leafs ground their way to the championship, only to lose to the defending Barrie Baycats. It was that loss that inspired Gleaner Leafs’ columnist R.S. Konjek to present two new words for consideration by the English language: stepability and grindertude. It also inspires us to remember what sport is really about: determination, grit, and drama, none of which are the domain of the city’s big name sports teams. We hope this inspires you to consider supporting some of the lesser-known teams like the Toronto Marlies Hockey Club by taking in a game or two. As they are more affordable for families (Maple Leafs games are free), it’s the perfect way to introduce a whole new generation to the glory of sport. The Aug. 21 derailment near Howland Avenue and Dupont Street exemplified the risks many residents have been trying to highlight for years. That incident — which sent two locomotives and several rail cars off the tracks — is still under investigation, and was but the latest for concern. Residents are quick to note that the train from the July 2013 derailment that killed 47 residents in Lac-Mégantic, Quebec, had passed through the Annex with crude oil only days before meeting its end in the small town. At a well-attended town hall in April organized by Chrystia Freeland (MP, University-Rosedale) and several of her Toronto-based colleagues, residents questioned whether safety regulations adequately account for today’s typical loads (crude oil, chemicals, etc. ), as well as whether the rail cars themselves meet the highest safety standards, before asking why dangerous goods could not be diverted altogether. How many among us can attend one more community consultation meeting on a future development that does not contemplate the projected public transit ramifications? The province and city have decreed that development should occur at transit nodes, without providing any assurance to those of us who actually use transit how our already-overflowing buses, subways, and streetcars will take on more passengers. It is all very well and good to note that the closer a person lives to their place of work, the more likely that person is to walk or ride a bike to work, as a certain local councillor is fond of saying, but that doesn’t really address the issue. Thus, the absence of a plan is what earns transit a presence on this list. The neighbourhoods that fall within our coverage area have long welcomed people seeking a new home. And this year was no different. It’s almost a year since our nation officially opened its arms to refugees from Syria, and our residents are continuing to provide support to those arrivals. But we covered other types of homecoming in our neighbourhood as well. Sprott House opened its doors to LGBTQ2S youth in January, while the Evergreen Centre for Street-Involved Youth is set to relocate to Spadina Avenue in September of next year. The Rogers Foundation also made Hot Docs cinema a permanent home for storytelling thanks to its $5-million donation that enabled the Hot Docs to purchase the Bloor Street theatre and rename it in the family’s name. 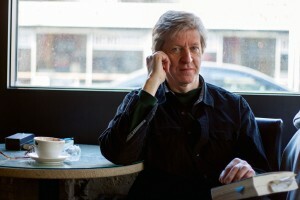 PHOTO BY NEILAND BRISSENDEN/GLEANER NEWS: R.H. Thomson poses at the Green Beanery in March. The Order of Canada member starred in You Will Remember Me at the Tarragon Theatre in March and April. Livability was a major theme on our pages this year. We’ve covered the City of Toronto’s initiatives on dog ownership, a plethora of park initiatives (both renewing old parks and finding creative ways to add new ones), and plans for streetscaping. What we’ve noticed is how many of those initiatives come from the community itself, without whom we wouldn’t have such a vibrant farmers’ market, say, or bike lanes on Bloor Street. (For the latter matter, we unabashedly tip our hat to this newspaper’s publisher, who as the chair of the Bloor Annex BIA managed to finish something that was begun 40 years ago.) That commitment to building our neighbourhood, whether tree by tree, bike lane by bike lane, or festival by festival, is what makes our neighbourhood such a special place to live.